The Six Million Dollar Man is an American television series about a fictional cyborg working for the OSI (which was usually said to refer to the Office of Scientific Intelligence, but sometimes was called the Office of Scientific Investigation as well as the Office of Strategic Intelligence). The show was based on the novel Cyborg by Martin Caidin, and during pre-production, that was the proposed title of the series. It aired on the ABC network as a regular series from 1974 to 1978, after following three television movies aired in 1973. The title role of Steve Austin was played by Lee Majors, who subsequently became a pop culture icon of the 1970s. A spin-off of the show was produced called The Bionic Woman. 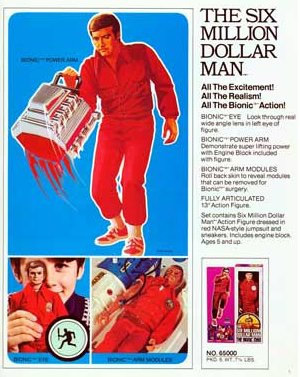 In the mid 70’s, pretty much every boy that I knew had the Six Million Dollar Man action figure. Steve Austin’s TV adventures were crucial viewing for more than just kids, among viewers were toy executives hungry for the next success in the world of media tie-in toys. Today the massive marketing madness Engines were bigger back then too.starts six months before a movie hits theatres, but back then a large toy line based on a TV of film was a new idea. The 12″ GI Joe toy line was a legendary toy industry success that Kenner was anxious to duplicate with their own extensive Steve Austin collection. For years the toy industry wanted to duplicate the success of the Barbie Doll, but in a boy’s toy line. GI Joe taught the industry that relabelling the doll an “action figure” and providing a steady stream of realistic accessories yielded stratospheric sales. Sales didn’t end with a single action figure. 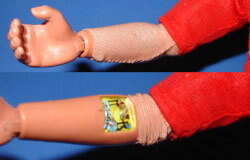 The toy gained value as the boy’s collection grew, and in this case the TV series provided plenty of fodder for play. Sixxy’s TV adventures had action, science fiction, even sasquatch! All of these inspired many toys.